This kind of thing, I imagine, must happen to a lot of movie goers who rely mostly on their Internet to get the movies they want to watch. It's cheaper, more convenient, and have the option to watch with subtitles from the comfort of your home. The thing I find most irksome is when a movie contains a seasonal theme, because movie goers love to watch movies when they relate to the holidays they revolve around. Bad Santa is perfect for Christmas time, horror flicks are perfect for halloween, etc. in a blue moon, they premiered movies even before they debuted in theatres. While they didn't do this regularly, I was always glued to that channel while channel surfing to see what I could see before anybody else. Sony has a film coming out soon called LIFE. I couldn't find anything about it on my Roku device, and there's been more than one movie made by the same title, so finding the one my friend was talking about was less than easy. film and how much profit they are making in comparison with similar films. 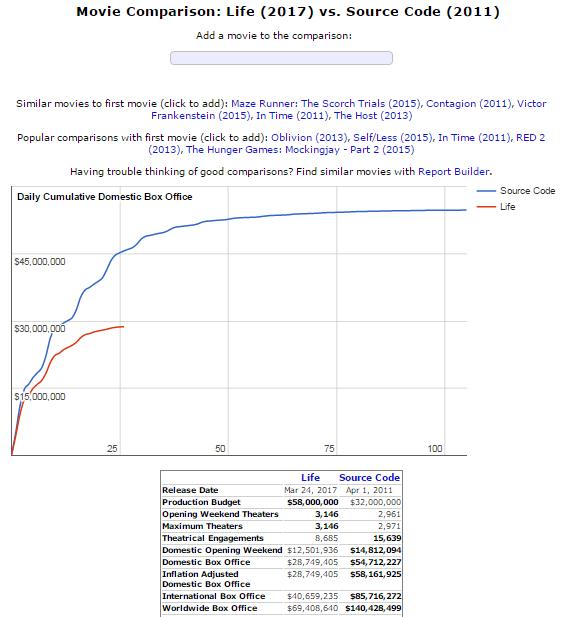 You can see that LIFE spent almost double the amount in production than SOURCE CODE. Also, according to the-numbers dot com, you can see that SOURCE CODE did really well their first month compared to LIFE (thus far); unless the statistics are flawed.